About 30 years ago at the Mornington Pier a woman could be found climbing down the ladder and entering the water in the cut (the area where the Plover is usually moored) on a regular basis. She would wade into the water until it was chest height. Within a few minutes the very large local Smooth Stingray that hung around the harbour would come up to her and gently manoeuvre its body until it was flattened against hers. There was nothing for the woman to fear as she was in no danger. The Stingray was just as pleased to see her as she was to see it. She would then happily hand feed this magnificent creature some Pilchards by hand to the delight and awe of locals and tourists watching from the land. 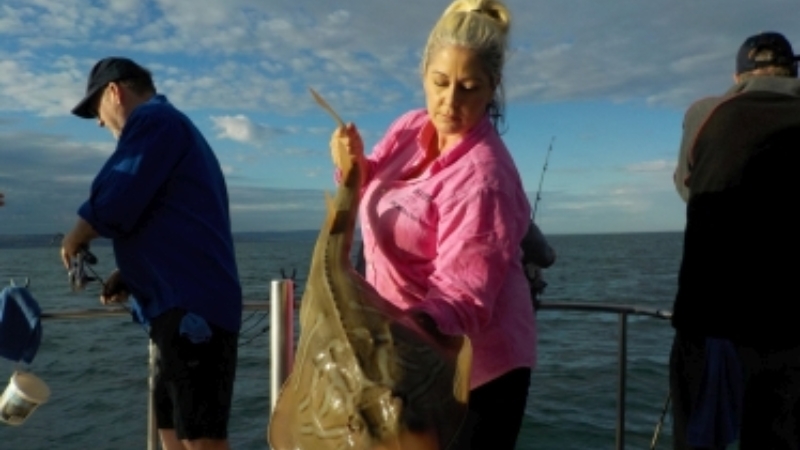 Sadly, several reports in the local and state newspaper recently have put these magnificent marine animals into the spotlight because some nasty people (mostly ignorant fishermen) are abusing them, so we thought we would continue the momentum of education with a positive article about the Rays and Skates of Port Phillip. The major difference between the two species is their reproductive systems. The rays bear live young and the skates are egg layers. During the breeding season (spring and summer), males of various stingray species use their ability to sense certain electrical signals given off by mature females to locate a mate. When a male is courting a female, he follows her closely, biting at her pectoral disc. 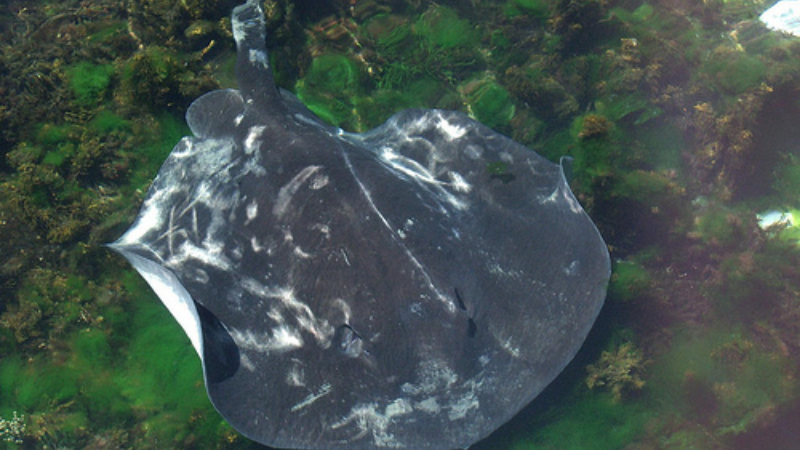 A pair of claspers on the underside of a ray or skate (at the base of the tail) identifies it as a male. Females do not have these. They spend time “dancing” before the copulation occurs. Rays and skates have been known to store sperm and not give birth until they decide the timing is right. Generally speaking, stingrays are kite shaped and have streamlined tails with one or more venomous barbs. Stingrays are a type of ray but not all rays are stingrays. This group can also include Electric Rays, Butterfly Rays, Round Rays, Guitar Fish and Sawfish. Rays have plate like teeth adapted for crushing their prey. Rays protect themselves with a venomous barb and are generally larger than skates. The colour of rays can vary but often drab brown or grey. Often found in shallow water. Skates tend to be roundish or triangular in shape with heavier, fleshier tails that have small fins towards the ends. Skates have small teeth. They often have a thorny projection on their back and tail for protection. The colour of skates can vary but often boldly patterned. They are slow to grown, have low reproductive rates and very vulnerable to over fishing. Their pectoral fins have been used as a substitution for “scallops” or fish meal. More often found in deep water. Both rays and skates are majestic and graceful marine creatures. Two large rays currently make the Mornington Harbour there home. Locals have affectionately called them Black Jack (a Smooth Ray, black, about 1.5 m in diameter - see photo) and Hoover (also a Smooth Stingray, motley grey, about 2.5 m in diameter). They glide between the moored vessels, scouring the sea floor for morsels of food. After every charter they received a bonus feed from the charter vessel with an entrée of excess bait. The majority of rays and skate are carnivorous, meaning their diet consists of other animals, they never eat plants. They are bottom dwelling animals that scour the sea floor for little creatures that live beneath the sand like worms, shrimp and squid. Alongside these small ocean animals, they may eat small fish, clams, oysters and even sea snails. Some rays such as the manta and devil rays are filter feeders relying on plankton as their food source. The flattened bodies of stingrays allow them to effectively conceal themselves in their environments. Stingrays do this by agitating the sand and hiding beneath it. Because their eyes are on top of their bodies and their mouths on the undersides, stingrays cannot see their prey; instead, they use smell and electro-receptors (like radar). Skates and rays range widely in size, from just a few centimetres in width to over 9 meters wide! The smallest rays in the world are the Short-nosed Electric Rays which are approximately the size of a pancake, measuring 10 cm across weighing only 0.5 kg. The biggest ray is the Manta Ray (located in tropical waters), which can reach up to 900 cm in width and may weigh many tons! 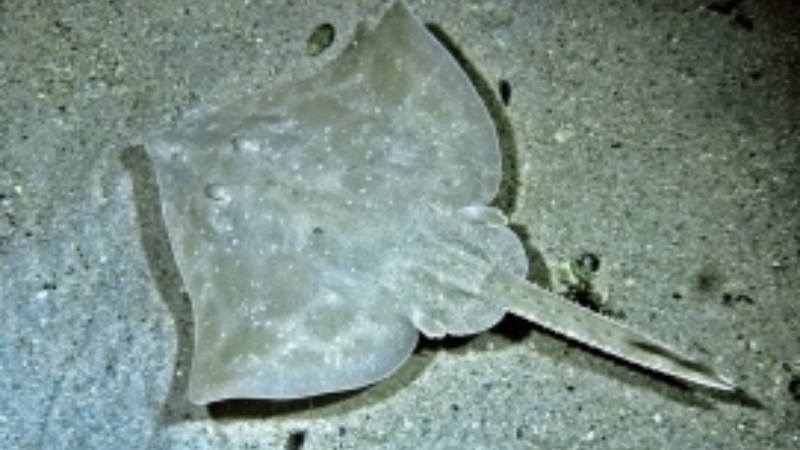 The smallest skate in the world is the Starry Skate which only reaches a maximum total length of 76 cm. 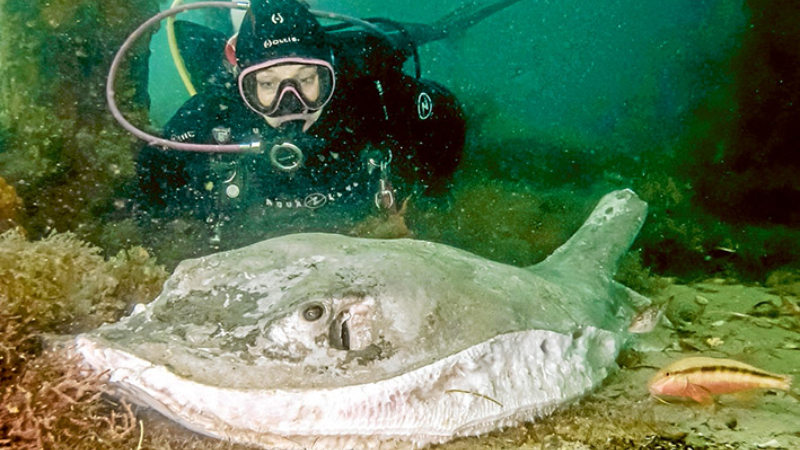 The common skate is the largest skate in the world, reaching up to 250 cm in length. Those in Port Phillip come in a variety of sizes. Hoover at Mornington is the biggest we have seen so far in the temperate waters of the bay. 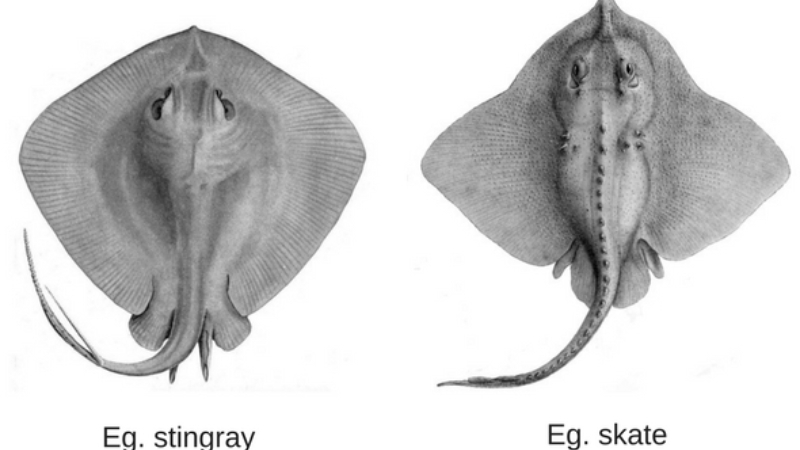 Both the ray and the skate are cartilaginous fish and closely related to the shark. Ironically the Elephant Shark, despite its name is not a shark but related to the ray family. Rare to see them in Port Phillip. Generally found in Westernport. And ultimately, the greatest "enemy" of skates and rays is humans. 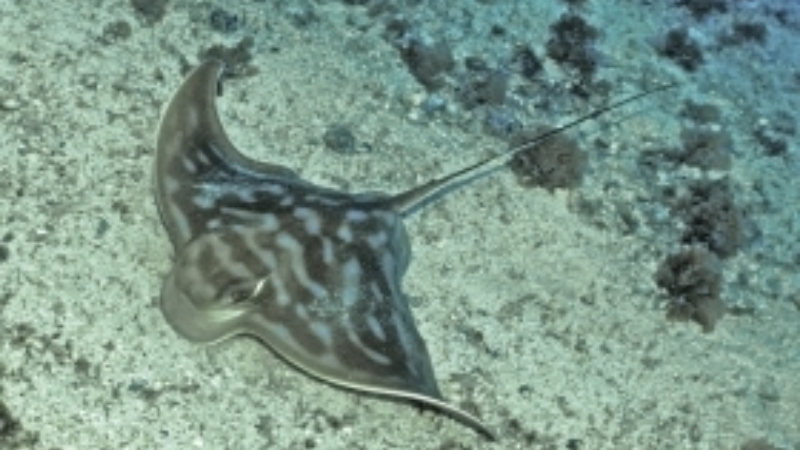 Many species of skates and rays have declined significantly in abundance in the last few decades due in part to over-exploitation by direct and indirect fisheries. Although these marine animals can be legally caught and kept in Victorian waters by fishermen for a food source it is confusing as to why one would won’t to? There is little if any edible meat. The crew at Bay Fish N Trips thinks it is best to take a photo, then release the ray or skate back into the water without injury. It is highly illegal for anyone to catch one of these animals and mutilate it for bait or any other reason. Some ignorant fishermen can be blamed for this cruel acts. It is a horrible slow painful death for these animals. If you see marine wildlife being cruelly treated, please report your sightings to Fisheries Victoria. Please not that most fishermen do the right thing!! Rays and Skate are essentially harmless sea creatures. They are inquisitive and playful. 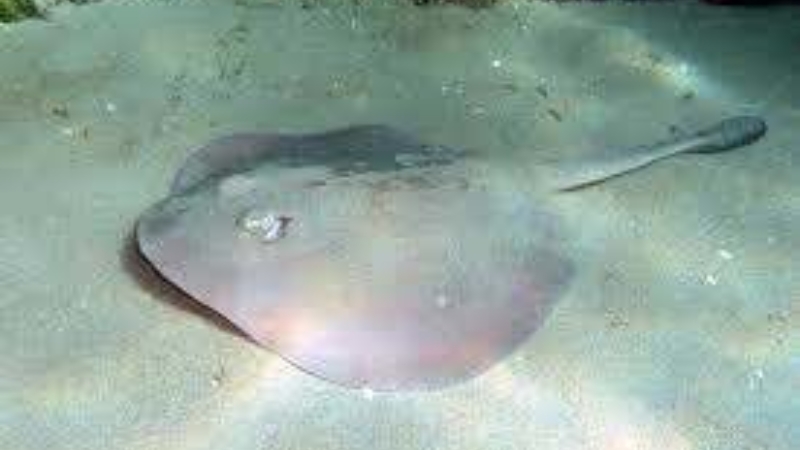 Yes they can cause injury if you accidentally stand on them or hover above while diving but humans are not on their food chain therefore rays and skates will not attack, unless they feel cornered. Like any wild animal, they need to be treated with cautious respect. Source of information and photos: Wikipedia, fisheries Victoria, Australian Museum, Australian Geographic 2012 (1), Fishes of Australia, the Mornington News, PortPhillipMarineLife.net.au and Bay Fish N Trips Pty Ltd.